Crafti Beer welcomes one of Worcestershire’s newest brewers with their great selection of award winning beers. You have arrived at the one place where you can buy all of The Hop Shed’s bottled beers and have them shipped direct to your door, fresh and straight from the brewery. Please explore the range of beers that are on offer, as there really is something to suit everyone’s taste. All the beers are bottled and shipped straight from the brewery so they arrive to you in the freshest condition with no standing in a stock room for months on end. Let’s not hold you up any more. Please click below to order online now. Based in Suckley in Worcestershire The Hop Shed have set up their brewery in the foothills of the Malvern hills. Having featured on the channel 5 programme ‘Starting Up Starting Over’, they have built their brewery in an old chicken shed which has been the inspiration for the names of their beers. Having won a ‘Great Taste 2017 Award’ from ‘The Guild of Fine Foods’ for their Frizzle British IPA in their first year of brewing, it is a sure sign of the quality of these beers. We welcome you to preview all the descriptions for the beers and choose either a dedicated case of beer or try the selection box where you will get to try each of the beers on offer. Craftibeer has reviewed each of the beers in full and you can read our reviews in full here. A refreshing pale ale with hints of tropical fruit. Quadruple hopped with a new experimental hop, developed and grown on the farm where we brew. A truly British IPA, rich, golden with a floral hop aroma. A slight malty presence, followed by a significant hoppy bitterness from UK Cascade and First Gold. An easy drinking beer. Full of flavour despite the low ABV. Goldings and Jester hops combine to provide a traditional amber ale with a slight modern twist. A straw-coloured ale with fruity hop aromas and flavours from Endeavour and First Gold hops. A quenching beer. Appeals to lager drinkers as well as beer lovers. A full flavoured blonde ale with distinct grapefruit and passion fruit flavours, a bitter finish that leaves you wanting more. Another great beer from The Hop Shed Brewery. 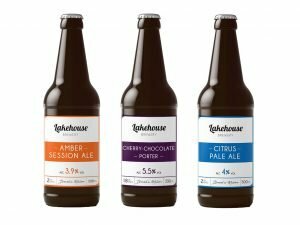 By ordering through CraftiBeer you will have your beers despatched directly from The Hop Shed within 48 working hours of your order being placed. Please note orders placed on a weekend or bank holidays will be processed the next working day. Please choose which beers you would like and use the shop to purchase them and let us know where you would like them delivered. We are confident the beers will reach you in the premium condition as intended by the brewery. However, if for any reason you feel the need to contact us please email contact@craftibeer.com so we can assist you.